Rumors have suggested Apple is planning to introduce dual-SIM dual standby functionality in some 2018 iPhone models, which would allow two SIM cards to be used at once, but it appears this functionality could perhaps be limited to China. According to a new report from Taiwanese site Economic Daily News [Google Translate], a Foxconn source has suggested the dual-SIM dual standby feature will be available in a version of the 6.1-inch low-cost LCD iPhone that's "a unique model for China." 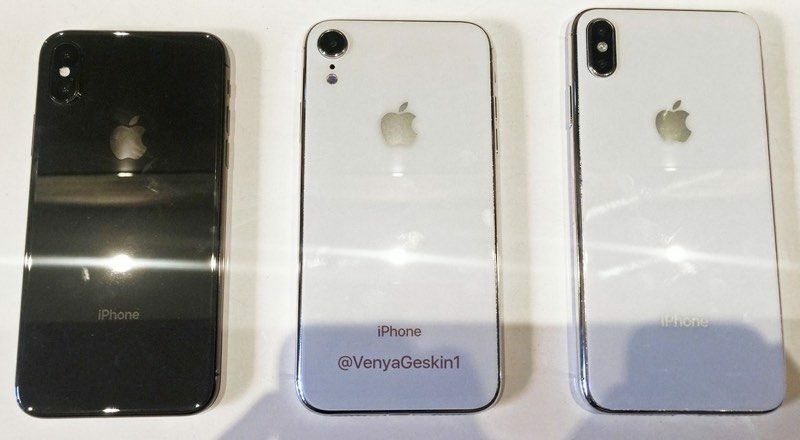 Production on the new iPhones slated for a September debut is well underway, with Foxconn employees suggesting Apple is producing four unique model numbers (801, 802, 803, and 804) for the upcoming iPhones, hinting at the extra two SIM model. The site suggests that 801 and 802 correspond to the 5.8 and 6.5-inch iPhones, while the latter two numbers are for separate 6.1-inch LCD iPhones. Economic Daily News says that Apple is planning to introduce a dual-SIM dual standby iPhone in China because it is common for people in China to have more than one mobile phone number. As many as three to four billion consumers use dual SIM cards, and many smartphones in China already offer support for more than one SIM card. To remain competitive in the Chinese market and lure customers from Android devices, Apple also needs to support the feature. Respected Apple analyst Ming-Chi Kuo has also suggested that Apple is working on two 6.1-inch iPhone models for launch in 2018, one with dual-SIM dual standby and a second with a single SIM. While he suggested Apple might make the dual-SIM dual standby model more expensive, he did not indicate that it would be limited to China. Kuo believes that Apple could price the dual-SIM dual standby 6.1-inch iPhone at $650 to $750, while selling the single SIM model at a lower price, perhaps $550 to $650. Both models would also be sold alongside more expensive OLED models in 5.8 and 6.5-inch sizes, for a three-iPhone lineup. In past notes targeted at investors, Kuo has also said that the 6.5-inch iPhone could include dual-SIM dual standby, but today's report from Economic Daily News does not mention the possibility. A separate rumor from the Chinese supply chain has indicated that 2018 iPhones will feature both an embedded Apple SIM and a traditional SIM card tray, so it's possible that dual-SIM dual standby will be available in non-Chinese devices through this implementation method. The Apple SIM is not available in China, so China would require a separate device with two physical SIM slots. If this is the plan, though, it is not clear why Apple is not also producing a 6.5-inch iPhone with physical dual-SIM dual standby functionality for China, as plus-sized iPhones are highly popular in the country. Past rumors suggest the upcoming 2018 iPhone models will use Intel's XMM 7560 modem chips for faster LTE speeds than are available in the current crop of devices. There were some rumors indicating Apple might also use Qualcomm's X20 modems, but Qualcomm recently said that Apple will not be using Qualcomm chips in its 2018 iPhone lineup. Apple's specific plan for the SIM situation in the 2018 iPhones is a bit murky at this point based on the different rumors we've heard, but the new devices are expected to debut in just about six weeks if Apple sticks to its traditional September event, so we don't have too much longer to wait to find out just what Apple has in store for iPhones in 2018. Why the restriction to China? I want it here. I travel to Europe a lot. This is a must have feature for those that do. You just stole this story from 9 to 5 Mac! So now will there be lines of American scalpers lining up at Chinese Apple Stores to buy these and export to the US? Apple should just make it an option for sale everywhere....charge $50 extra and maybe make it online order only or something so they don't need to maintain in store inventory of phones with a seldom used feature but make it available for those who specifically want it. That is Apple's problem: "you don't know want you want, I know what you want". The mentally never changes. One of the major reasons of people in Taiwan or mainland China not choosing an iPhone is lacking of dual-SIM. Many people in the regions have their personal number and business number so a phone that can support dual-SIM should be critical. If this is true, wonder why India is being left out? Dual sim capability is a very popular feature there too.